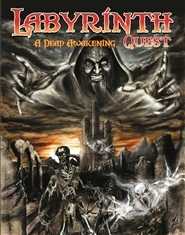 While on your way to mine silver in the Korgothian Hills, you discover that an evil wizard has returned from the dead and is creating an undead army. Will you be able to make it to his underground lair and vanquish him before he unleashes his hordes across the entire realm? 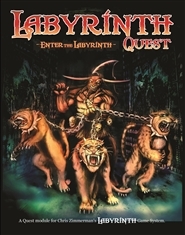 Enter the Labyrinth is the first quest I wrote for my Labyrinth Adventure Gaming System.Once you purchace the Labyrinth rulebook, I would strongly recommend beginning your gaming experience with this quest. 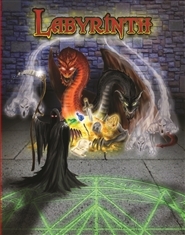 Enter the Labyrinth is a story about a kingdom which is on the brink of impending doom! An evil wizard who vowed over 100 years ago to destroy the kingdom had awakened from his slumber. You and your party members are to Enter the Labyrinth and find and destroy this evil menace before he reaches full strengh and unleashes his wrath!!! 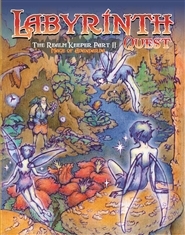 Goblins are running amuck and a poorly-armed race of curious-looking toad people are on the brink of extinction. 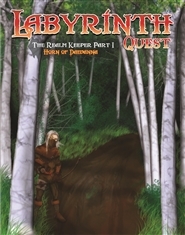 The goblins, under the leadership of their deadly commander, are sending out raiding parties to wipe out the toad people while mining the hills nearby for diamonds. 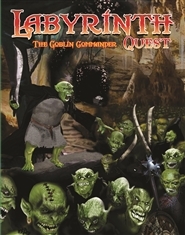 Perhaps you can aid this new-found race, destroy the goblin commander and his hordes and get rich in the process! Your party is on a quest to find a magical horn that was created by an old mage from a distant land. This special horn contains a spell that holds the trolls at bay; trolls that almost conquered Daevanna many years ago... Find the horn and return it to the Elvin Kingdom of Daevanna before the trolls return once again and destroy the kingdom and all within!